Nyos changed the name of Reef Pepper to Instant Plankton! Since early 2015 with new Formular! Planktonic microfeed. 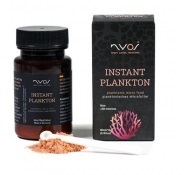 Nyos Instant Plankton / Instant Plankton is a highly developed plankton microfeed clusters for corals, invertebrates, and marine ornamental fish (particle size: 5-20 mü). -We recommend mixing with salt water and adding a few drops of Nyos ABSOLUTE AMINOS in a separate container for the perfect activation. 1-3 dosage spoons per 100l daily. We recommend mixing Instant Plankton with Nyos ABSOLUTE AMINOS, plus a little water, and allow to soak for some minutes. Composition: Fish and fish derivatives, molluscs and crustaceans, algae, oils and fats, cereals, vegetables, derivates of vegetable origin, yeasts, mineral nutrients. Ingredients: Raw protein 45%, raw fat 13%, raw fibre 2%, raw ash 10%. Additives: Vitamins, provitamins and chemically well-defined substances having similar effect (per kg): Vit. A 107.000 I.E., Vit. D3 1.500 I.E., Vit. E 280mg, Vit. B1 12 mg, Vit. B2 24mg, Vit. B6 10mg, Vit. B12 40mcg, Vit. K3 18mg, Vit. C 200mg, folic acid 1,4mg, CA-D-pantothenate 53,2mg, nicotine acid 140mg. Colourants. Antioxidants. Preservatives.